Hello. My name’s Karl. I’m 36 37 38 39 40 41, and live next to the sea (I mean really, right next to the sea ) in the often really cold North East of England. 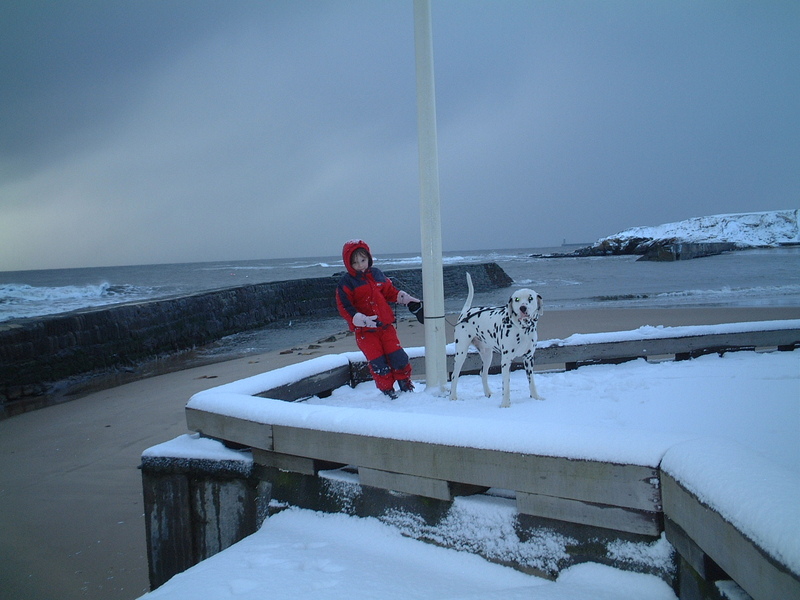 I’ve been married for 13 14 15 16 17 18 years, and have one daughter, and a huge dalmation . 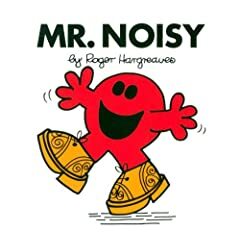 I actually wrote the Mr Man story, Mr Noisy. No really, I did. We had a very noisy neighbour when I was five, and our class wrote the story of this and sent it off to Roger Hargreaves . . . a couple of months later, there it was, published. Not that I ever got a penny. But at least I have the satisfaction of knowing that I did it. I REALLY like skiing. A few days after my first week in the mountains, I had my annual appraisal with my then boss. At the end, he asked me what I wanted to do long term for a career. My instant reply was, “Well, work’s OK, but I’d much rather go skiing for three months of the year. That’s expensive though, so I’ll need a job that pays at least fifteen months worth – what can you do? “. His derisive dismissal still drives me to make this a reality. I took my wife’s name when we married. Well, actually a year after – I thought I wouldn’t mind not sharing a name, but I did. And I couldn’t ask her to do something I wasn’t prepared to do myself. As a result of pool-side high-jinks, I ended up in the wrong end of a swimming pool when I was eight, and couldn’t swim. One of the kids I was playing with pulled me out. Thank you. I used to do sub aqua at school, but gave it up in the end – after about 30 minutes under water, I’d get a serious dose of THE FEAR. These two facts are probably not unrelated. 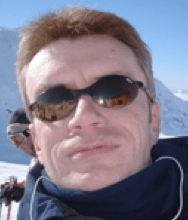 My background’s in engineering and production management – I was a Chartered Engineer at 27, and completed an MBA at Durham a few years later. Having been an independent management consultant for seven years, I now work as a community enterprise coach. I help people put together start-up businesses, and re-build ones that aren’t doing what their owners want. It’s some of the best fun you could ever have without actually riding a bike . I’ve always been fairly physically active – from cycling and cross-country running at school, a half-marathon between drinks as a student, and regular periods of running. OK, it was jogging really – no racing. When I moved to the North of England, I started running a little more seriously. There were a couple of years doing the Great North Run (the world’s biggest half marathon), but I soon got diverted from this when I discovered skiing. In 2005, I accepted my Tall Friend’s challenge of the Stratford 220 Triathlon. I liked it a lot, so did two more that year. Since then, I’ve gone on to do other sprint races, and The Cleveland Steelman (a half Ironman distance race) in 2008. This year I completed Ironman France – 2.4 mile swim; 112 mile bike and a full 26.2 mile marathon. All in a shade over 15 hours – yes I fully intend to dine out on that one for a long time. But I do like to ride a bike. Mostly, this is for pleasure, but I like to combine business with pleasure. So I often ride to work (30 mile round trip) . . . and once I’m there, off to visit my clients. Some of them find it a bit odd that I ride a bike rather than drive a big flash car, but what better status symbol could there be? Over the last few years, I’ve become increasingly pro-bike. There are lost of reasons, but for most of the trips most of us make, it’s the perfect form of transport. I want to change the way people in non-biking societies view bikes, and help to bring about a revolution in transportation that’s quiet, green, friendly, and above all else, fun. What a fantastic effort! 22.3 mph on the bike is incredible. Thanks. There were a few hills but I’d venture to say that 3/4 of the route was relatively flat. My goal was to avg. 19mph so I suprised myself. I couldn’t find your contact details. I came here after seeing a video by you about a short cycle lane in Gateshead. That wasn’t the worst example by a long chalk. the website of the Warrington Cycle Campaign. Hi Karl, Did you ever find a birdwatching book for southern France? I saw a comment by you on amazon and am looking for a similar gift for my mum who has a house in the Gers region. Please provide your email address as we would like to include your blog in our distribution of press releases. Thank you in advance for your reply, we are looking forward to hearing from you in a positive way. HI Karl, I thought you might be interested in a current down under drama hanging on helmets since I gather GB has fended off compulsory helmets in recent years. But even as they sign a contract for the Bixi version to come to the city, Alison Cohen, who works for the winning bidder, the US company ALTA, admits to my camera, just how hard, if not impossible, compulsory helmets will make bringing bike share to Australia. Indeed, as a traffic engineer also points out in my movie, Bike share has never been set up in a coulegal helmet along with the bike. Is this a reason why you’ve been fending off compulsory helmets in GB I wonder? Here’s the movie, what I found out. And here’s my new bike Blog, obsessed by issues like these. A line in my news on bike share went wrong some how. “Indeed, as a traffic engineer points out in my movie, bike share has never been set up in a, country with compulsory helmets. There’s just no way to deliver a legal helmet, automatically, along with the bike on the street. Thanks, enjoy the rest of your week. You wrote the Mr Noisy book?? I remember that from my childhood! It’s a small small world thanks to the internet. With oil spills in the news and May being National Bike Month, the Sierra Club is putting on a bike haiku contest. The poet winner will receive a brand-new Breezer Uptown 8 bicycle . Runners-up will get a Kryptonite lock and a Nutcase helmet. A panel of bike-commuting Sierra Club staffers will pick the finalists and the winner will be selected by Congressman Earl Blumenauer of Oregon, founder of the Congressional Bicycle Caucus. All you have to do is: join the Bicycle group on Climate Crossroads ( http://www.climatecrossroads.org ) , Sierra Club’s social network on climate; post a picture to the group’s gallery; write a haiku about your bike and/or bike commuting. Deadline to enter is May 31 at noon PST . Any mention of this contest on your site is greatly appreciated. Give me a call if you have any questions. My name is Jesse Florendo and I work with a documentary called Paul Goodman Changed My Life. We’re sponsoring a contest to encourage people to reduce global warming and improve transportation options in their own communities. Winners in the US and Europe will receive new bicycles from Breezer Bikes and Biomega, respectively. The contest is co-sponsored by the Alliance for Biking & Walking, the World Carfree Network, the Bicycle Coalition of Maine, and Dissent Magazine. We’d love to get the word out about this contest to Do The Right Thing’s readers. This is a really cool opportunity that we think they’d be excited about. There’s some more info about the contest below, or you can check out paulgoodmanfilm.com/bike. The contest launched October 1st and runs through October, so if you’re interested in posting about it, today or tomorrow would be great. Please feel free to get in touch if you have any questions about the contest, the film, or Paul Goodman. To honor 20th century philosopher and social theorist Paul Goodman’s legacy, JSL Films, producer of the documentary Paul Goodman Changed My Life, is holding a contest to help encourage transportation alternatives. Paul Goodman, a writer, a radical, and a renaissance man, was the co-author of “Banning Cars from Manhattan,” a 1961 proposal to improve New York’s streets by eliminating private auto traffic. Nearly half a century later, his ideas are now heralded as being before their time, with limiting traffic in city centers becoming more and more common. Paul Goodman Changed My Life is honoring Goodman’s legacy by inviting people to propose change in their own communities. Anyone who submits five proposals to their local government (mayor, city council, etc.) can enter a drawing to win a new bicycle. One winner in the United States will win a bike courtesy of Breezer Bikes, and one winner in Europe will win a bike courtesy of Biomega. Wishng you a Happy & Successful New Year… while appreciating the good work you are doing all year long. I have checked out your site on several occasions and I really enjoy reading your posts. My name is Chuck. I represent Biking.com, an online resource for all things biking. I was curious if you accept any advertising or sponsorships on your blog. We would love to be a sponsor of your great site! Good luck with your build, and please send photos. Knowing how apprealing people find the C2C and countryside around the North East the group who staged the Bellingham Bash in 2007 are back with Dales Outdoor Weekend. It happens May 7-8 at Stanhope on the Showground. Dawes Cycles have joined other supporters – Chain Events, Vango and Buff. More info by writing event@dalesoutdoorweekend.com and one of the eight man organising team will come back to you quickly. Hi Karl, its a small World. I am from the North East as well – Wallsend. Me and a group of friends do sponsored cycling every year, we are doing the Carlisle to Newcastle route this year. Let me know if your interested, thanks. Happy Birthday ! Hope I have the date right. Thanks for the caption competitions! and if possible give me a mention!